Imagine making one small change to your sales pages to get more people scrolling down the page and reading? It taps into your customers’ deepest desires, no matter who they are. How do you feel when I ask you to imagine this kind of success in your own business? 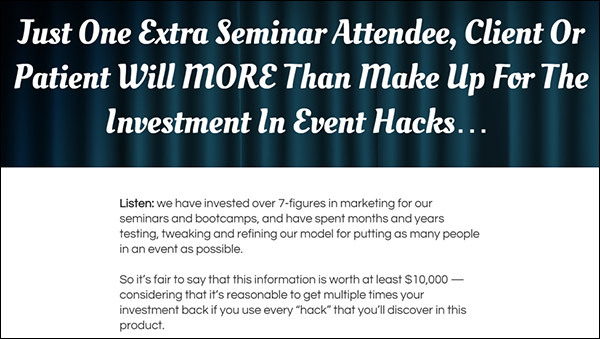 You may feel energized and ready to start planning a new campaign or product launch. If nothing else, you want to keep reading to see if this article is as good as I suggest. Now imagine stirring that same level of excitement in your customers…simply by putting their own imaginations to work. What’s the most persuasive word in your arsenal? Why is it so persuasive? Because it taps into your customers’ deepest desires, no matter who they are. When you ask people to imagine something, it helps them engage their imaginations. Until then, they’re simply reading your words. By prompting them to imagine, you suddenly make it personal. Now they see themselves using your product or service and enjoying its benefits. And that makes your product a necessary step in achieving those benefits. Once people see themselves with more money, less stress, or whatever else you promise, they essentially talk themselves into buying, often before they’ve reached the Buy Now button. You see, people buy for emotional reasons, not practical ones. And by tapping into the hopes and dreams they already hold dear, you trigger a deep desire for any product that can give it to them. In another article, I share specifically how imagine triggers the buying response. Today, I’d like to share three formulas for putting this little-known trick to use in your own sales pages, drawing from three promotions that do it right. AWAI – Can You Write a Letter Like This One? In most cases, you don’t open a sales pitch with an invitation to imagine. Your readers aren’t ready to start dreaming until you’ve explained what’s possible. While there are probably multiple ways to do this, the best sales letter example I’ve seen is AWAI’s control-breaking Can You Write a Letter Like This One? 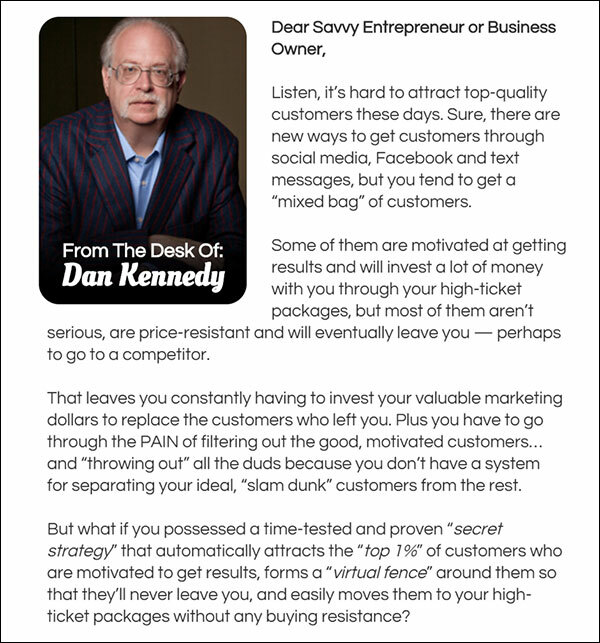 The sales letter opens with a headline that grabs most of us by the heart. The opening continues by painting a picture of life as we all wish it could be. That’s just the opening of this persuasive sales page, and it continues just as powerfully. First, it paints a picture of the easy life: exotic trips, expensive gifts purchased on a whim, home renovations, and other extravagances. Then it paints an equally vivid picture of most people’s reality: living paycheck-to-paycheck, working at a job they hate, unable to afford the break they so desperately need. The promise is then driven home: no matter who you are or what your previous experience, you can have the easy life. The proof is piled on: examples of real people who went from financial difficulties to raging success. Then the reader asked to tap into the power of their own imagination. That’s the power of imagine. You don’t define it. Your readers do. After such detailed descriptions of life as it could be and life as it is, the pump is now primed. Readers see all the possibilities. Having been told several rags-to-riches stories and details about how they can live life on their own terms, they’re ready to take a close look at their own dreams. First, notice where it is in the sales page: right above the offer, inviting readers to picture their own version of success. That’s the power of imagine. You don’t define it. Your readers do. It’s their own dream, personalized by their imagination. Could anything be more persuasive? That’s precisely why imagine is a great way to wind up your presentation as you prepare to make your offer. Spend lots of time painting the picture of how wonderful life can be after using your product. Then, when you make your promise, pile on the proof. Save imagine until just before the offer. By this time, you’ve given readers a lot of visuals to feed their imagination. Simply tell them to “imagine,” and their favorite dream is at hand, building their desire and pushing them toward the sale. This sales letter example from GKIC begins with messaging designed to get the target audience emotionally involved from first glance. 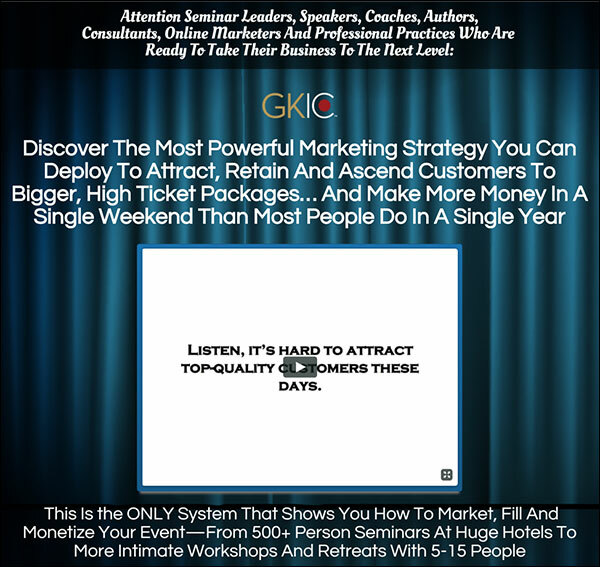 In this sales letter, GKIC is targeting people with a specific problem: speakers, coaches, authors, and other professionals who want to grow their business with events. They could, as in the AWAI promotion, paint word pictures of happy professionals sipping umbrella drinks on the beach. But let’s be honest. That’s not what this audience wants. They want to build an empire based on their own process or system. They’re teaching it already to individuals or small groups, but they’re ready to scale big. So, every word of the above-the-fold content is aimed squarely at their desires… but then it turns to the problem at hand. After a friendly greeting, the problem is introduced: how hard it is to attract top-quality customers, which leaves you dealing with never-ending churn. This problem is described with enough detail to grab your attention if this is your problem, then a solution is hinted at. To tap into the emotions that are already present in struggling professionals. 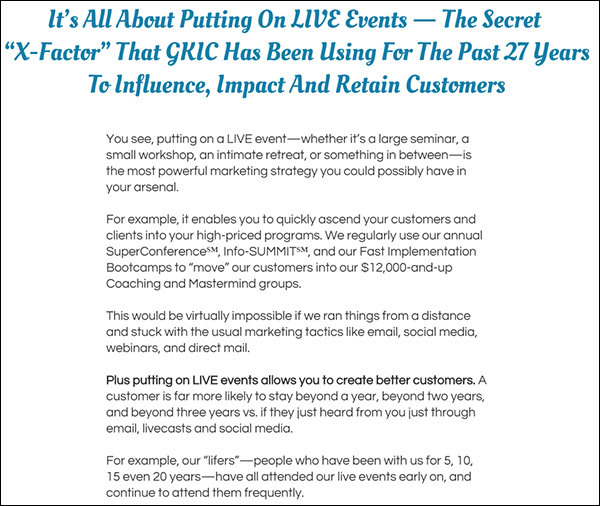 Next, they introduce the solution, the “secret X-Factor” behind GKIC’s success, with enough proof to validate their idea that events can transform a business. The proof is piled on. Evidence is given to persuade people that events are the way to go and that GKIC is the best source for learning. Now, with the offer made and compelling social proof given, it’s time to close. Here, readers are point-blank invited to imagine. It’s exactly what this audience wants, and GKIC is offering a tangible way to achieve it. The problem-agitate-solution formula allows you to quickly weed out anyone who isn’t your ideal prospect. Only people who want the promise you make or are struggling with this particular problem will read. The problem-agitate-solution formula allows you to quickly weed out anyone who isn’t your ideal prospect. But here’s the thing: They’ll only keep reading if you convince them that you understand their problem and have a credible solution. That’s why it’s critical that you build rapport early in your promotion. 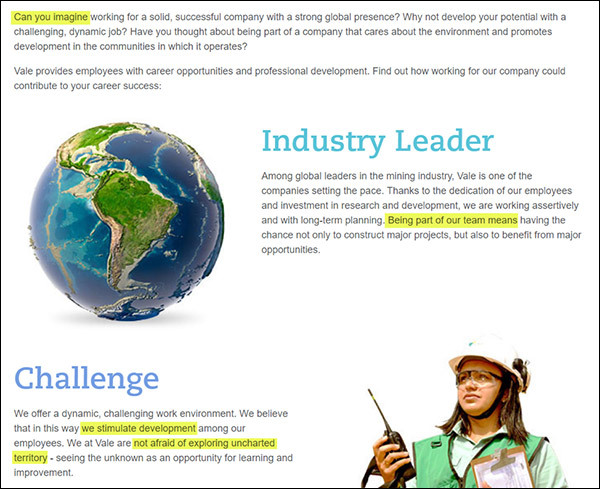 As in the first example, don’t start your presentation with imagine. Instead, start by talking about the problem in a way that builds your credibility. Basically, you understand it and have solved it, and you’re sharing your expertise. Be sure to provide lots of information to support your claims and give credible proof that your solution works. Once you’ve laid this groundwork, when you invite people to imagine a better way, they’re ready. 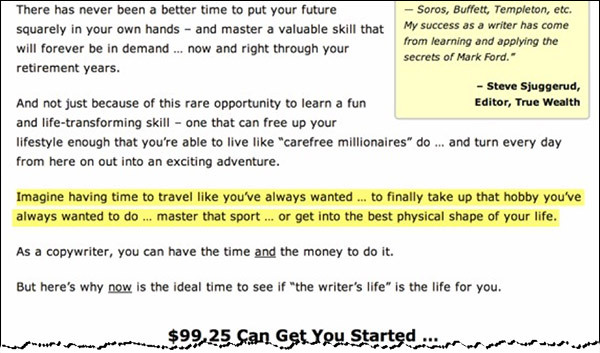 We just looked at two sales letter examples that hold off on triggering imagine until just before or after the offer. The beginning of the promotion is all groundwork. Does this mean you never open with imagine? In most cases, you need to seed people’s imaginations, to help them see possibilities where they didn’t dare to see them before. But sometimes, people are already primed. They have the dream. They just need the vehicle to get them there. 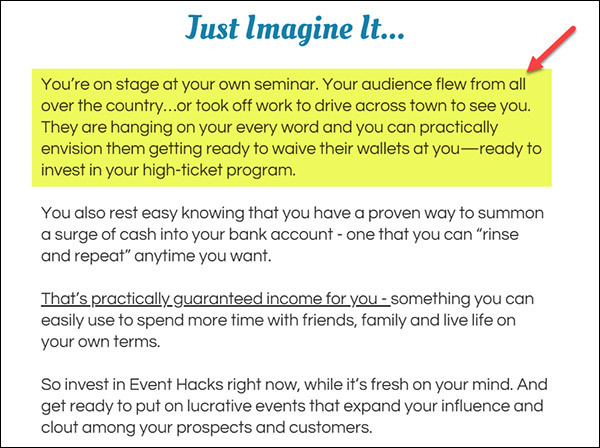 That’s when you can use imagine as the big idea for your promotion. Let me show you how Vale does it in this promotion. 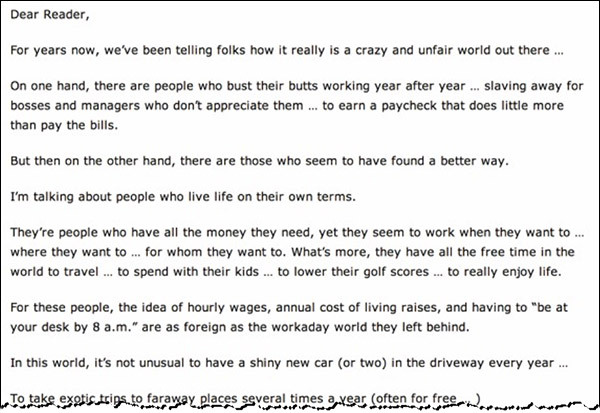 Notice they touch on the areas that are most likely to be frustrations at “ordinary” jobs. This sets them apart as an employer who will give as much as they ask from you. Vale uses this technique perfectly. They never cross the line to create hype. Instead, they paint a picture of what an exciting, fulfilling career should feel like, and then invite you to be part of their team. As you can see, you can build your entire offer on imagine. The key is to know how open your audience is to the promise you have for them. If they’re the type of people who are seeking a dream already, this style of promotion may be your best bet. The promise is painted vividly. But it’s always followed by rock-solid proof, whether concrete examples of how the promise will be delivered or social proof in the form of testimonials and success stories. 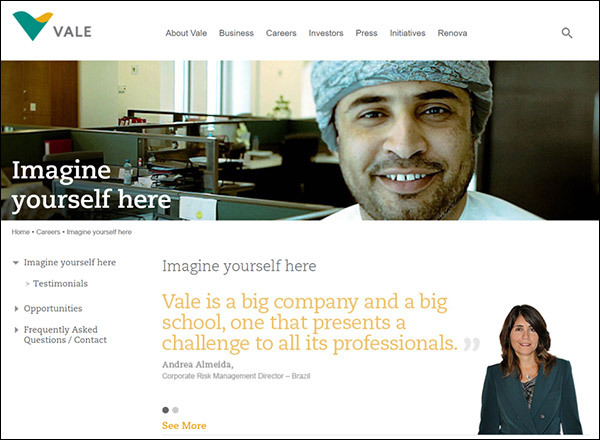 For Vale, imagine was used to create a recruitment page, but it works equally well for a sales page. If that’s your aim, ask people to imagine the improved life they’ll enjoy if they use your product or service. Then tell them why it’s possible. Make a big promise about how rich or happy they’ll be. Then tell them a few success stories. Pull in research or case studies that prove your methods work. Showcase other well-known people who agree with your claims. Tell stories of ordinary people who have followed your system and achieved their dreams. Create lists—the longer, the better. Just make sure every proof element is credible. Imagine is always tied to emotions—love, joy, greed, and pride are big ones. The dreams your readers dream are their deepest, most cherished desires. So be careful using this technique. You must be able to tap into those dreams without becoming manipulative or hyped. Sometimes your readers have already made the dreams public and are actively working on them. In this case, you can rev up their imaginations early—even in the headline or introduction if you want. For these readers, introduce imagine just before your offer. By then, they’ve begun to pull out their dreams and dared to hope they’re possible. Ask readers to imagine their own lives changed. Then make the offer and let their own desires drive them to accept. Imagine is one of the most persuasive words in your arsenal. But you’ve got to use it right. 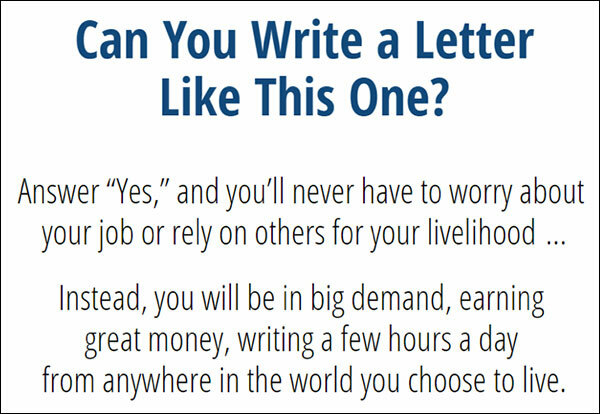 Plug it into the sales letter formula that most suits your readers. Tie it to strong emotions and powerful images. Build rapport and credibility. Then stand back. Let your reader’s imagination take over. Their dreams will do the rest. 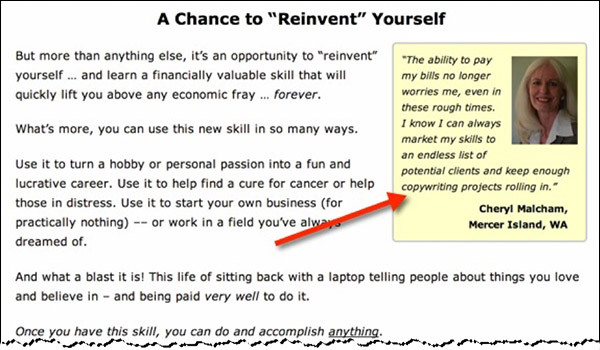 The post The Most Persuasive Word in the English Language (Plus 3 Sales Letter Formulas That Put It to Work) appeared first on DigitalMarketer.